The Customer Assistance Program (CAP) offers payment plans for customers with a fixed income. CAP participants are given affordable, monthly, long-term bill payment plans so they can maintain their gas service. The payments are based on their income, not their gas usage. CAP participants make affordable payments to maintain service by paying between 8-10 percent of their total monthly before-tax income each month. Your household income meets the guidelines below. You must be a current Peoples customer with active residential heating service. The CAP bill provides you with more information on CAP, and gives you important details about your CAP account. 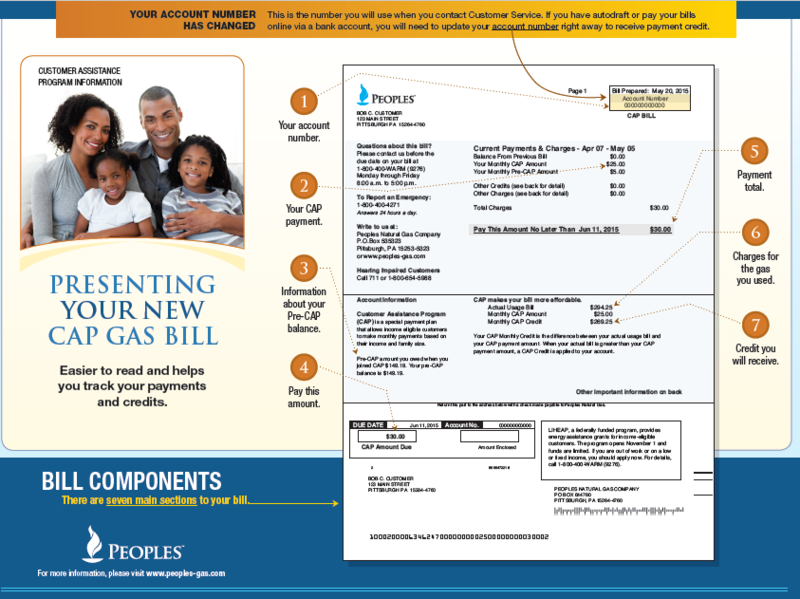 The sample CAP Gas Bill below breaks down the areas of the bill and explains where you can find the seven main sections of your bill.